You are here: Home / soup / Cheeseburger Soup – Easy and Delicious! 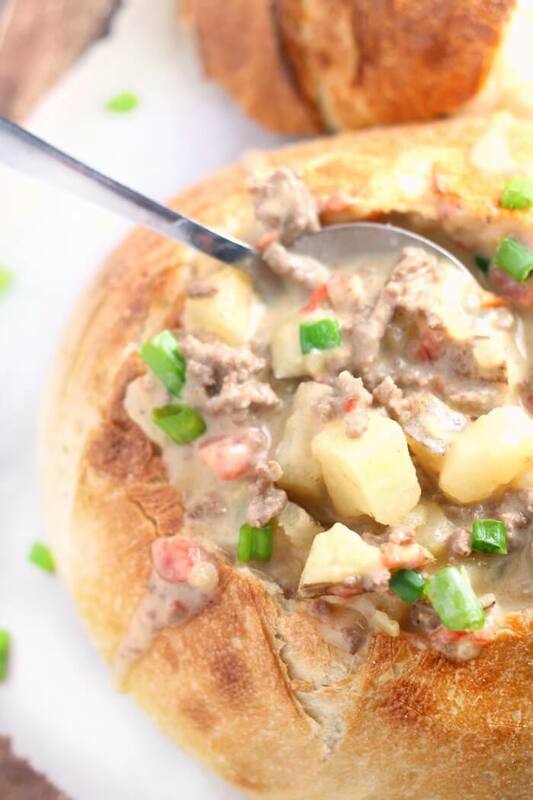 Cheeseburger soup made with potatoes, tomatoes, chiles, and cheese is the perfect lazy Sunday soup when the weather’s chilly and you just want to hang out on the couch under a blanket! Cheeseburger soup! This soup is so easy to make and is the ultimate comfort food. 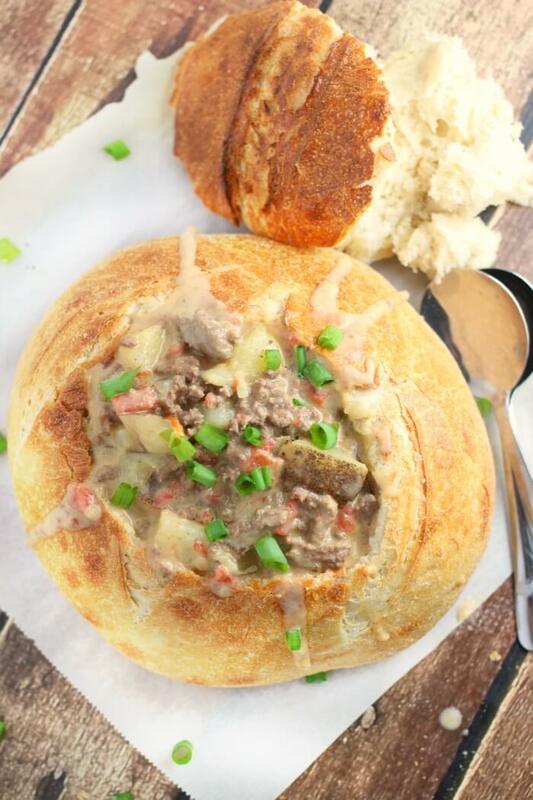 We keep this cheeseburger soup recipe on our regular rotation all fall and winter long. It’s so versatile, too! 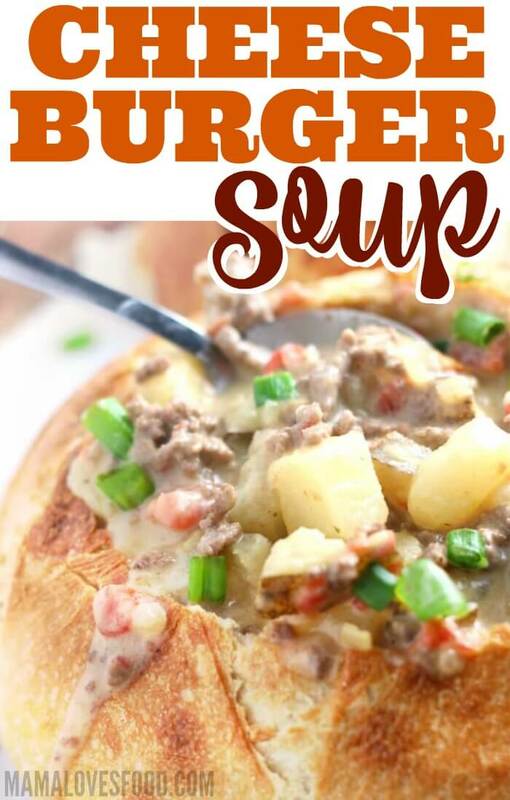 Add bacon for bacon cheeseburger soup, use Ro*tel for spicy cheeseburger soup, skip the potatoes for low carb cheeseburger soup, or throw it all in the slow cooker for crockpot cheeseburger soup! Add a side of Beer Bread and some Refrigerator Pickles and you’re good to go! 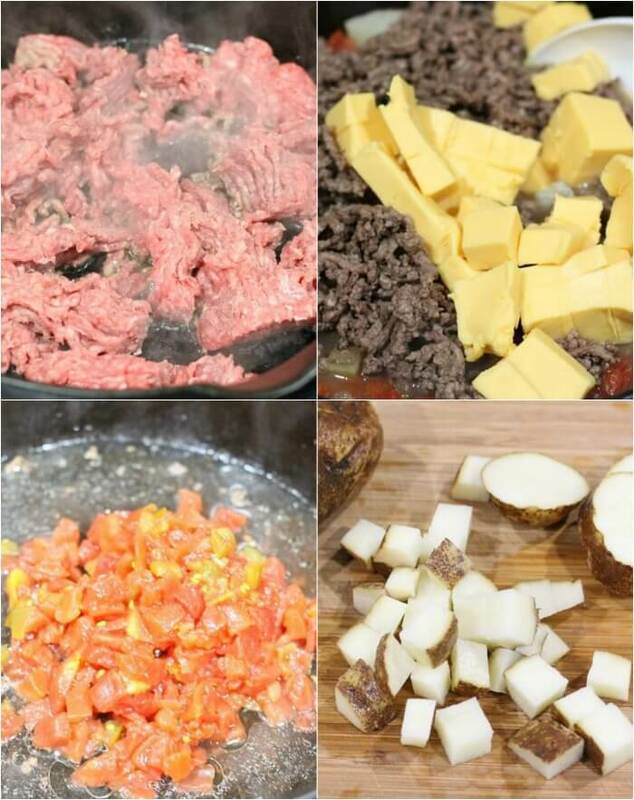 Ground Beef -If you’re groaning and thinking about that annoying “browning the meat part” you should use my favorite kitchen hack – making proteins ahead. We shop in bulk and instead of shoving all the food in the freezer raw, I’ll cook the whole lot of it ahead of time and then portion it into Tupperware. That way when I want to make something (like this ammmmmazing soup), I can just grab a container out of the freezer and get going. Tomatoes – We used Ro*tel to give this soup a little kick. You could totally bring things up another notch with a few chopped fresh jalapenos, but this was just the right amount of heat for us. Or if you don’t like heat at all, stick with plain diced tomatoes. Chicken stock – click the link to find my favorite recipe! 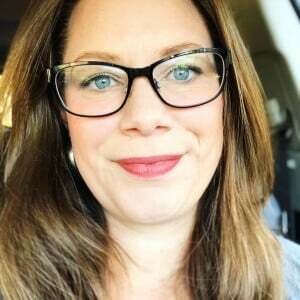 Russet Potato – I like Russet potatoes for this recipe because I feel like it gives a loaded baked potato feel (and P.S. I love loaded potatoes). If you’re partial to another type of spud though, don’t be coy – try it out and let us know in the comments how it tasted! American or Velveeta Cheese – American cheese or Velveeta cheese are both perfect in this because they melt beautifully. 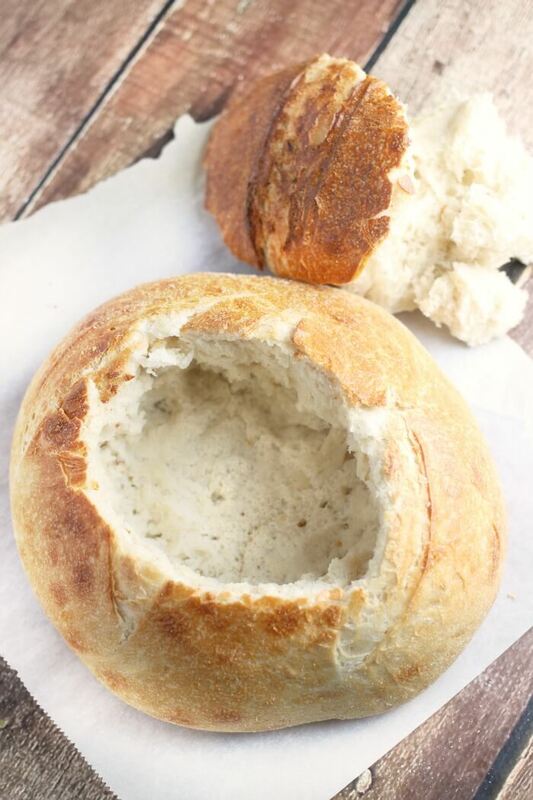 Bread Bowls (here’s my favorite French bread recipe!) 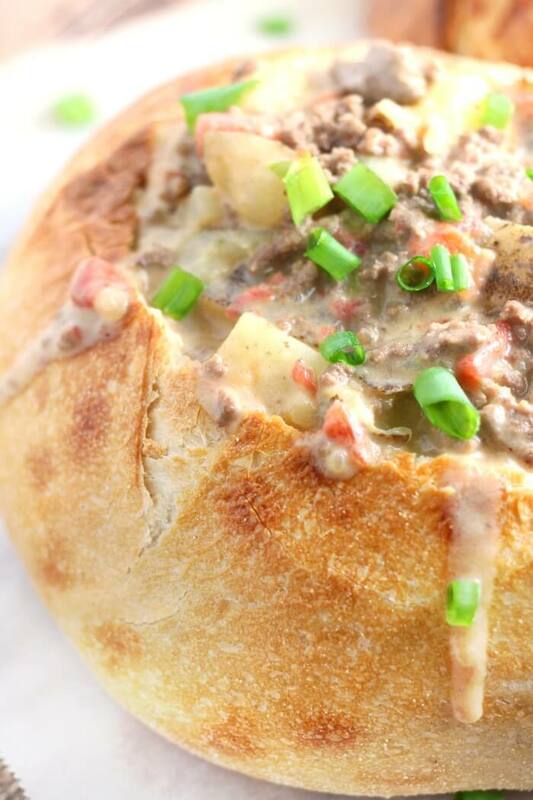 -Bread bowls are unquestionably the best way to serve this soup. I mean, it’s a little tongue in cheek, right? What with it basically being a deconstructed cheeseburger. But also (and most importantly) it’s crazy delicious. You can grab a round loaf at the market or make your own with our no knead beer bread recipe! Green Onion – Adds a touch of brightness in both look and flavor. Jalapeno – To add extra kick for the hot heads in your family. First, brown ground beef in stock pot, drain and set aside. Next, add tomatoes and chicken stock to pot and bring to a simmer. Then, add potatoes and cook covered, about ten minutes, until potatoes are done (check by piercing with a fork). Finally, re-incorporate ground beef and add cheese. Stir over medium/low heat until everything is mixed in and heated through. 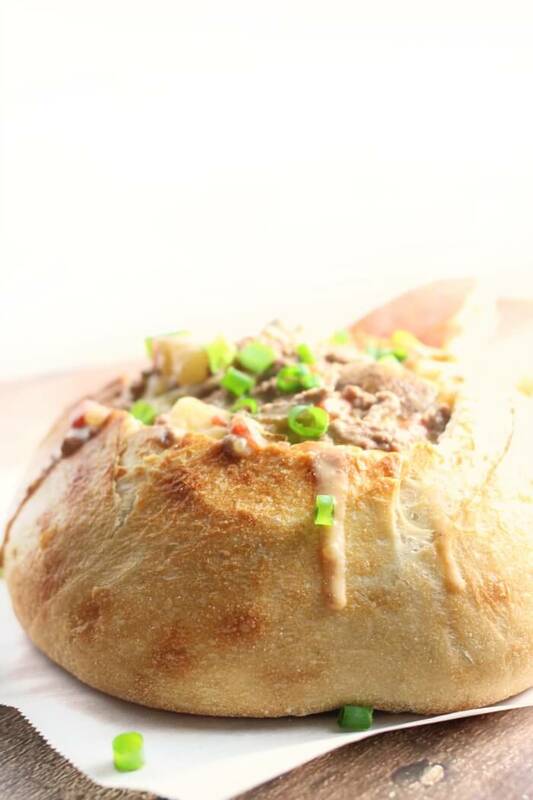 Serve in bread bowls and garnish with green onion or jalapeno. Enjoy! 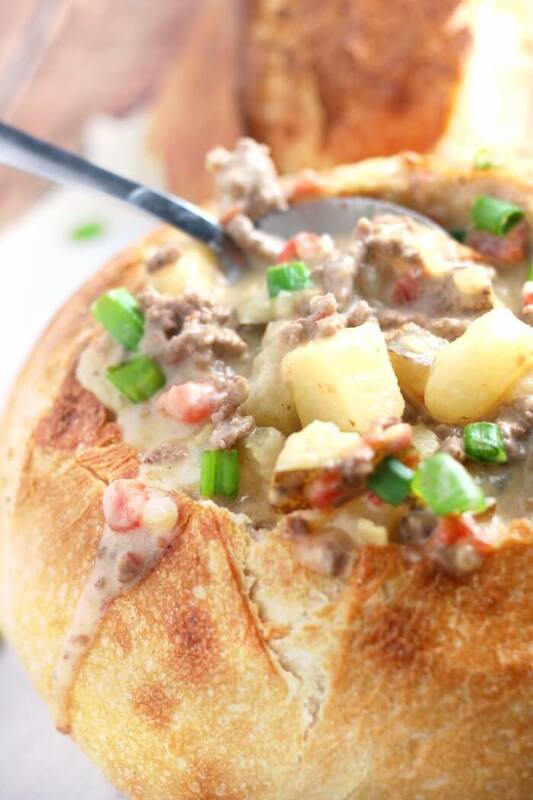 Yes, you can make Crockpot Cheeseburger Soup! Toss everything except the cheese and garnishes into your slow cooker and cook high for 4 – 6 hours, or low 8 – 10 hours. At the end stir in the cheese until it’s melted and fully incorporated. You can make Cheeseburger Soup ahead of time and store it in the refrigerator for up to three days, or in the freezer for up to three months. Make sure you allow the soup to cool before freezing, and store in a sealed air tight container. You can freeze cheeseburger soup. It reheats well. I like to freeze it in portion sizes so I can easily reheat just enough for a quick lunch. When ready to eat you can thaw it in a saucepan on low heat or in the microwave, stirring intermittently – you may need to add a little extra water or broth if the soup has thickened too much. 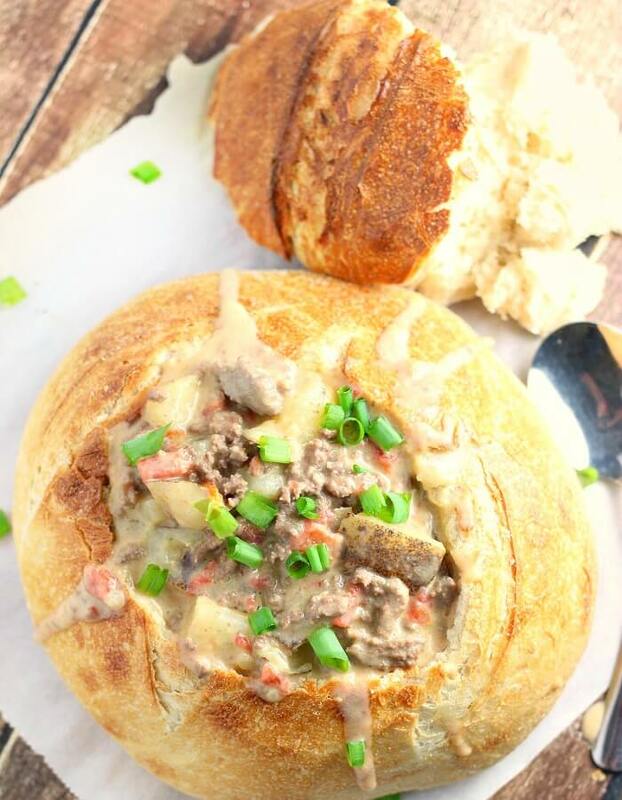 Cheeseburger soup is not low carb, but could be made lower carb by eliminating the potatoes and not using a bread bowl! You can substitute with a different protein in cheeseburger soup. Some ideas are: ground chicken, ground turkey, or a non-meat sub like TVP (textured vegetable protein). You could even use leftover baked chicken, steak, or prime rib! I love to add some diced homemade pickles, crumbled bacon, fresh tomato, and sometimes jalapenos. Chopped onions or chives are delicious as well. 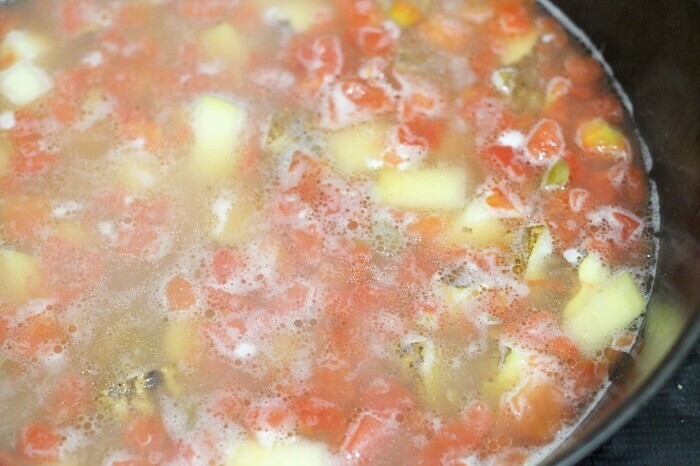 Plain Cheeseburger Soup – skip the spice by switching the Ro*tel for stewed or diced tomatoes. Bacon Cheeseburger Soup – finish things off with a pile of crispy crumbled bacon on top of each bowl for an easy Bacon Cheeseburger Soup! 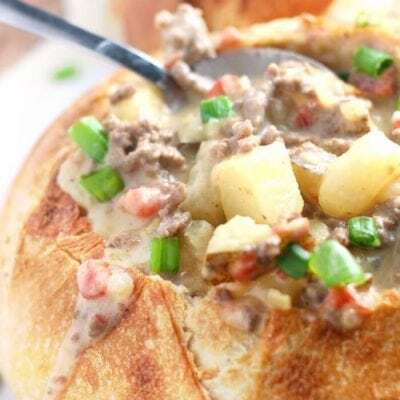 Spicy Cheeseburger Soup – this recipe already has a little spice, but if you want more, add a teaspoon of chipotle powder! Low Carb Cheeseburger Soup – want to lose the carbs? Just skip the potatoes! Cheeseburger Dip – Cheeseburger dip is sooooo yummy! I love eating it with Fritos! Bacon Cheeseburger Sloppy Joes – It’s almost like cheeseburger dip on a bun. But with bacon. Mmmmmm. Hamburger Salad – Loaded Burger Salad, for when you want to be healthy, but not really. BBQ Bacon Cheeseburger Grilled Cheese – It’s like two beautiful worlds collided with this cheeseburger grilled cheese recipe! Loaded Cheeseburger Skewers – Make these loaded cheeseburger kabobs with meatballs or cut up hamburger patties. So fun for a party! Cheeseburger Filo Squares – Cheeseburger filo squares are for when you want cheeseburgers, but have to pretend you’re fancy. Pinkies up! 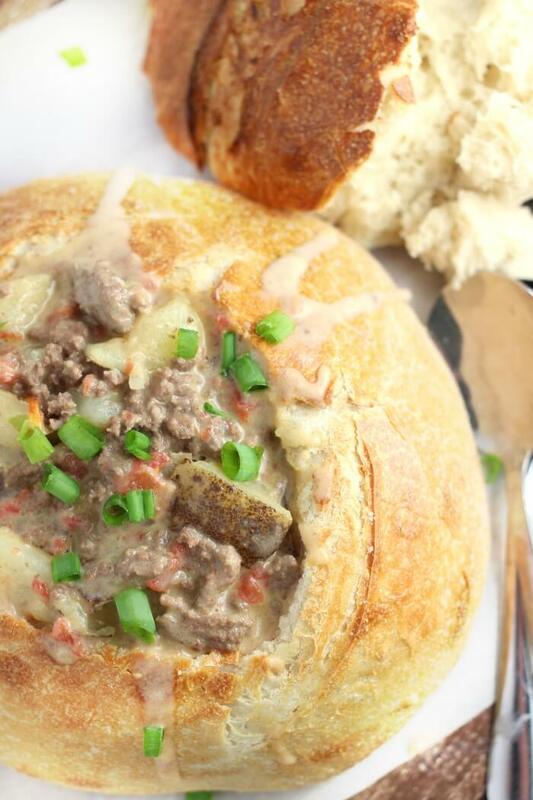 Cheeesburger soup made with potatoes, Ro*tel, and Velveeta cheese is the perfect lazy Sunday soup when the weather's chili and you just want to hang on the couch under a blanket! 2 cups chicken stock here's how I make chicken stock! In soup pot, brown ground beef, drain and set aside. Add Ro*tel and chicken stock to pot and bring to a simmer. Add potatoes and cook covered, about ten minutes, until potatoes are done (check by piercing with a fork). Reincorporate ground beef and add cheese. Stir over medium/low heat until everything is incorporated and heated through. Serve in bread bowls and garnish. Enjoy! Hi! This looks great, but do you think it would work with a non processed cheese? There is something about American Cheese that my tummy just does not like. Thanks for any suggestions. So I can use any soft cheese? Awesome!! thanks! What a thick and comforting soup. I love how creamy it is. This looks like the perfect comfort food! I need to add this to my dinner plans for the week! Hii! Wondering if you think this would be good with ground breakfast sausage? I have been scouring the interwebs the last few days to find a soup recipe to use some in.